If you want to add anything from your own local group please email us. Real and systematic change can only be achieved if we organise and fight togetherbut Disabled People deserve rights and to live without the gripping fear many have felt for the last 8 years. Following our protests in town and outside Cardigan job centre opposing the roll out of Universal Credit, more people got in contact to ask for support and advice regarding their benefits. Working with our local MP Ben Lake, the food bank and Croeso housing, we had a UC drop in advice surgery in Aberystwyth, which will be repeated next year in Cardigan. Three of us went to meet Leanne Wood when she came to Cardigan and raised our concerns about the roll out of UC. We have been regularly handing out flyers around town and engaging with people to raise awareness of the rollout of UC and putting More people got in contact with us, for advice on PIP claims, and im pleased to say, that all those we helped this year were successful with their claims or appeals. Through the sales of the Welsh Grannies, we have funds available now to go towards organising our future campaigns, and helping others in our community during sanctions, waiting times and late payments etc. We have had regular social meet ups, and hope to have many more in the future. Lets keep fighting the system best we can, lets be there to support each other along the way and keep hold of the friendships we have made through DPAC. Its going to be a tough year ahead with UC and Brexit affecting us all. Lets continue to help each other through this in solidarity. Thank you all for your contributions this year. To CPA people for travelling so far to campaign together, to Jon Plumpton for those amazing lollipops and posters you printed for all the demos, for those who turned up on cold mornings to stand outside the job centres, to all those helping us with translations so that we can have bi-lingual protests, and most importantly our strong bond of friendship that keep this group running. Our main activism in 2018 centred around Reading Borough Council’s proposal to scrap concessionary bus passes. 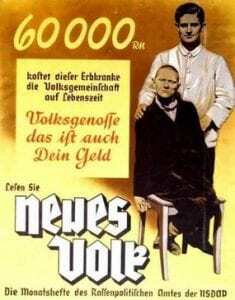 We eventually won in relation to passes for disabled people and for companion passes too. There were many elements to the win apart from our successful demos in town and media coverage: having information coming out from council sources as to what had been stated in their budget; support from the local Trades Council who bolstered our demos and helped spread the word and also support from Reading and District Labour Party, which voted to instruct the council to ditch the proposal. But this has been a long process and still continues, as their latest move has been to go back to a consultation on cancelling passes for pensioners and also charging for Readibus rides, which were previously free. We also began to try to gather information about the local hospital for patients diagnosed with mental health problems as the reports coming out of there are awful. March – National Day of Action – protest to stop and scrap universal credit outside Norwich City Council. 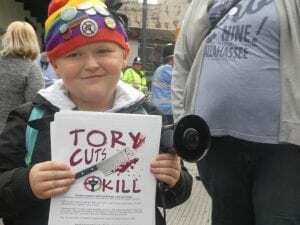 October – DPAC Norfolk organised a rally and march to Stop and Scrap Universal Credit. Over 150 people marched around Norwich city centre. 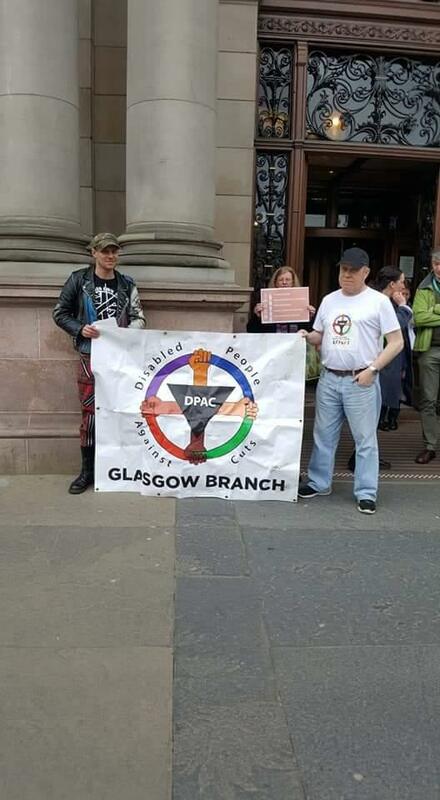 here is a brief account accompanied by pictures of what has been a hectic year (I can’t promise chronological acuracy) for DPAC GLASGOW. The backbone of our work has and continues to be resisting government attacks on the rights and dignitary of disabled people through changes in the benefit system we have held monthly pickets outside maximums offices against work capability assessments. We have also been proud to support other campaigns ie the struggle for equal pay for working women of Glasgow city council. I was privileged to be the only man allowed to speak at one of their lobbies. 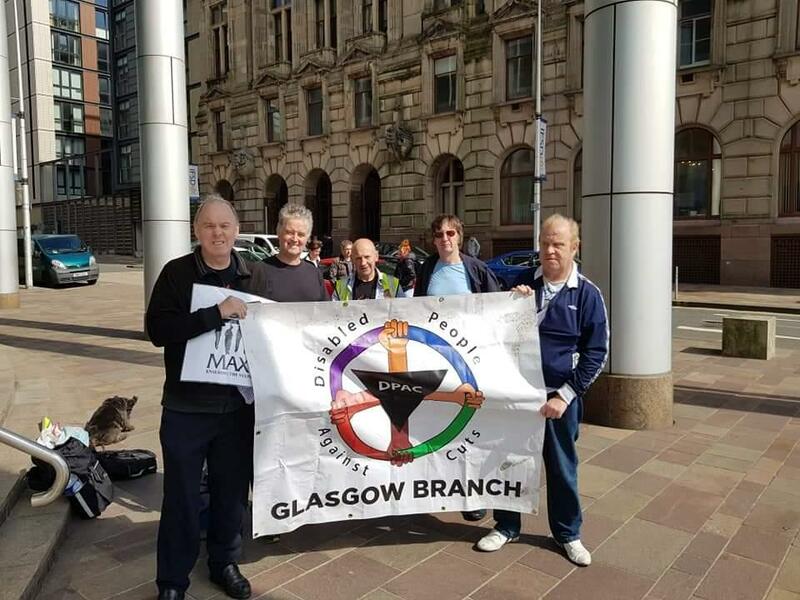 We also stood in solidarity with the get Glasgow moving campaign when they handed in their petition to Glasgow city council in July. One of the highlight was when 3 of our members went down to Birmingham to tell Theresa May and the Tory conference what we think of them. My personal highlight was our participation in the national day of action against universal credit we organised an excellent street stall in Argyll St and got a great response. we also made a couple of trips through to Edinburgh to the Scottish parliament on the first occasion to hear the evil Esther Mcvey answer questions before one of the parliamentary committees and on another occasion to meet Shirley Anne Sommerville. Like everyone else we expect to be even busier this year. 2018 has been a very difficult year for Northants dpac I’m pleased though we have managed to ensure Disabled Peoples anger towards the cuts and continuous attacks has not waned, A number of our members have had health issues which has impacted on our work. Individual people have continued to support people with pip, esa and other problems. Through our media work we have developed good media relationships with Northampton chronicle, echo, and Nene Enquirer . We supported save Northants services rally on the 17th FEB 2018. As Northamptonshire County Council has been in financial trouble due to national govt cuts, we have been able to get national media coverage of Disabled Peoples experience of Cuts. We have built up a good relationship with IWW branch locally We are actively involved in Save Northants Services umbrella organisation. We are involved with Northants Direct Action on actions and campaigns. 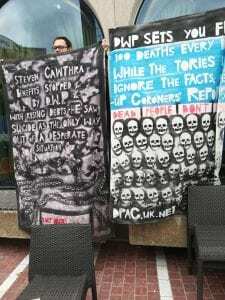 We supported tories out of Brum conference protest/action. We are building distant links with Labour Party locally for future work. 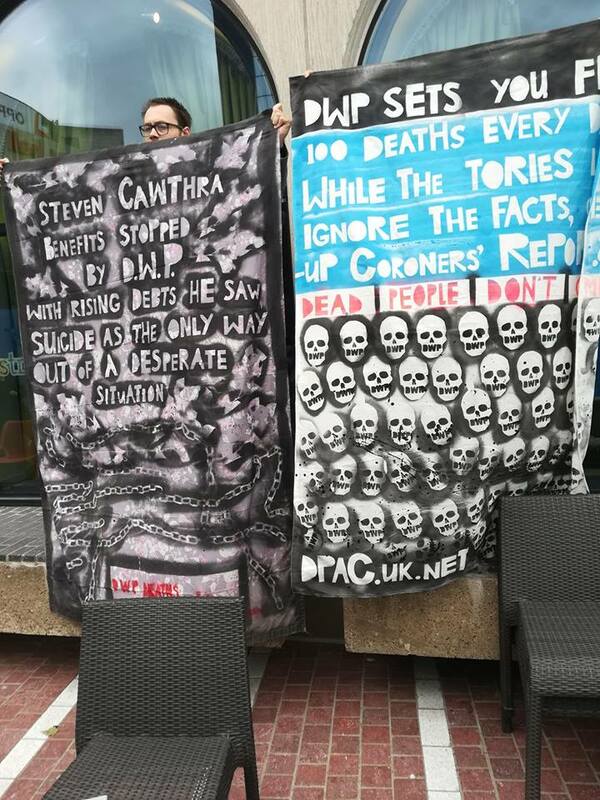 We joined a noisy picket of Northants Tories Gala Dinner with the guest of dishonour Savid Javid home secretary. 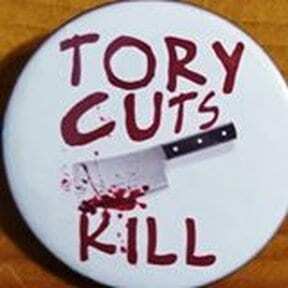 We continue to be an irritant in the fight against cuts in Northants. Have read each report with a great sense of admiration for the bravery and resilience that people have shown in their bid to bring the unfairness of the benefit cuts to the wider public. You are so very right when you highlight the sense of fear about whether the cuts will impact our lives, how will the PIP assessment go, seems not to matter that you once had a lifetime award, nothing is certain anymore. I digress, “thank you” for your hard work.